Rick Watson served as an elementary school teacher and principal with the Clark Country School District for thirty-six years. Originally from Kansas City, Missouri, Rick’s family migrated to southern Nevada in 1946 and located in Carver Park, a wartime housing project for the BMI war materials plant. His grade school education was spread over three schools including the Carver Park School, the Townsite School, and the Saint Peter’s School. 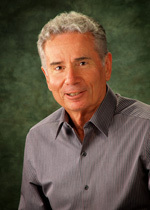 Rick graduated from Bishop Gorman High School and received his BA and MA in Education from Nevada Southern University (now the University of Nevada, Las Vegas). Rick married his college sweetheart, Joanne Favero Watson. They have four children and nine grandchildren. His association with the Henderson Historical Society allows Rick to learn more about the community he grew up in while reminiscing with friends and family about the good times that define this special community.